BMW India has made it official that second-generation X6 would be launched on 23rd July, 2015 in the country. Originally unveiled at 2014 Moscow Motor Show, the 2015 BMW X6 would be the company’s flagship SUV in India. Just like the ongoing model, which was launched in 2009, the new-generation X6 would be sold as Completely Built Unit (CBU). For those asking, BMW India would also launch the high-performance X6M in India later this year. 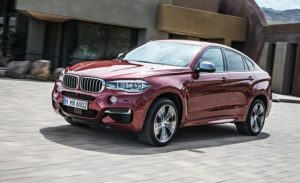 Take a look at the new X6 and it definitely looks bigger and wider than its predecessor which means more interior space and comfort but we will be talking about all these a bit later let us first find out what else is newin the second generation X6 exterior. The first and the most important styling feature of the x6 is its dynamic coupe like roofline which not only makes it look different from the rest of the SUV’s out there but also looks elegant and stylish. The front of the vehicle has a dominating character but you won’t definitely miss the signature BMW grille which now comes with Cerium Grey color, you will also notice that the Kidney shaped grille which looks fatter and wider compared to its predecessor. The standard Xenon headlamps gives the front a sharp appearance. You will also find the lower front bumper now gets bigger air dams which has been reshaped for both practicality and functionality; it helps the engine to keep cool and improve its efficiency also imporved airflow. Just like the front the rear too has received its fair share of u pdates. The L shaped full LED tail lamps at the rear has increased in length compared to its predecessor. The duel exhaust at the rear of the vehicle also looks new and the second generation BMW X6 comes with underbody protection which is made up of Brushed steel and it helps enhances the muscular appeal of the SUV. Step inside and you are welcomed by a trademark BMW cabin. The dashboard has horizontally been split into three parts. The upper half is black leather wrapped, the lower half gets an off-white treatment and splitting the two are slats of piano black and wood. The interior and the door trims are also optionally available in American Oak, Fineline Stripe, Fineline Pure, or Poplar Grain fine-wood trim fine-wood trim. The off-white materials used in the cabin gives it an airy feel. The seats can be adjusted electronically making it easy to find the right driving position and comfort. There is a fair bit of space at the back too but due to the centre arm rest and the air con controls, seating three at the back won’t be the most comfortable affair. Surprisingly, despite the coupe roofline, the low seating means there is quite a bit of head room even at the back. For those planning to go on a long family vacation need not worry about boot space. With the seat back upright the 2015 X6 makes 580 litres of space. Moreover the rear seat can be folded down in a 40:20:40 split thereby expanding on storage space. The 2015 X6 comes heavily loaded with features. From Head-Up Display, night vision with dynamic light spot, 360 degree camera to parking assist, the X6 has it all. In terms of safety, the X6 gets 6 airbags, ABS, EBD and all other abbreviations you can think of. It also gets Lane departure warning and pedestrian alert. For the passengers at the back there are two separate HD 9.2-inch monitors with separate DVD drives to view different films on. Talking about movies and sound, the 2015 BMW X6 also comes with a 16 speaker Bang and Olufsen high end surround sound system.The centre console gets a 10.25-inch screen below which is the dual zone climate control and the controls for the integrated Bang and Olufsen infotainment system. Aside from the media and navigation, the screen also displays vehicle information and settings too. All the buttons are soft touch and well within reach. And then there is the automatic tailgate operation. If you hands are full after a shopping spree, a quick wave of the foot under the rear bumper opens up the tailgate. Under the hood sits BMW’s most recent gem — a smooth, free-revving diesel six with not one, not two, but three turbos! The M50d’s 3.0-litre, triple-turbo straight-six produces 381bhp and commercial vehicle-like torque of 75.45kgm. All this is achieved because BMW has reduced the compression ratio of this diesel to just 16:1, really low considering few petrols nowadays come with a 12:1 ratio. The lower compression allows for greater ‘fill’ from the three turbos at maximum boost, and BMW has made sure injection pressure is good enough to supply plenty of diesel. The M50d’s injection pressure is upped to a really high 2,200bar when the engine is running at max speed. BMW’s are known to be driving machines, the X6’s weight tries to make an exception here. With significant amount of weight under its belly, the X6’s heaviness is felt at high speeds and it has quite a bit of body roll. The vehicle gets bouncy on bad roads and the run flat tyres really don’t help matters much. Surprisingly this BMW has a space saver spare wheel but still BMW has opted for run flat tyres, which do end up spoiling the ride quality to a certain extent. The vehicle is on the stiffer side but still glides on good roads, only to be unsettled on large bumps. BMW doesn’t offer mode selection on this variant of the X6 and you can’t choose between Comfort or Sport, surprising. High speed stability is excellent and although it’s not as sharp as other BMWs, its still much ahead of its key rivals (from the SUV segment). The steering is a delight and has immense feel and feedback. It isn’t much heavy at low speeds but as you go faster, the steering simply comes into its own, offering a very tactile feel to the drive. Brakes are very sure footed and have terrific stopping power, with the pedal feel being extremely positive. The X6 has good off-road ability and can easily traverse most terrains, thereby offering an splendid balance of good on and off-road driving. Like its comfort features, the manufacturer has also given due importance to its safety department by equipping it with several innovative aspects. It has active head restraints along with eight airbags and seatbelts, which can minimize the risk of injuries to the occupants inside. Other protective features include dynamic stability control including anti lock braking system, cornering brake control, dynamic traction control, electric parking brake with auto hold and an emergency spare wheel. It also has functions like hill start assistance, brake drying and brake stand-by function. Apart from this, this vehicle is also blessed with adaptive LED headlamps, parking assistance, side impact protection, ISOFIX child seat mountings, run flat indicator, run flat tyres with reinforced side walls, warning triangles with first aid kit and an immobilizer with crash sensors. The new BMW X6 is an excellent car, and since it is equipped with “M” package as standard, it is even more attractive. The only real drawback of the vehicle is its size. Most of the urban areas are not big enough to handle a car as big as this one. You are going to have a lot of trouble while trying to park it. But, the size does not matter a lot as all its competing cars are of the same size barring Porsche Macan. X6 definitely looks rich and the performance figures match the sporty looks. Though if you are looking for a proper SUV, which can do a fair amount of off-roading, you should probably go for the Land Rovers but since there are only a few people in India who try out their 1 crore+ vehicles off-road, X6 seems to be the perfect choice.